a. The SEC banning of short-selling of 799 financial stocks. b. The US government announcement of the intention to buy up bad bank debt, where the initial outlay will cost the US Tax payer 700 billion. Whilst the stock markets soared, bonds slumped and the US Dollar fell, as alluded to in last Sundays analysis that the consequences of a continuous stream of bailing out bank after bank will be a loss of confidence in US Treasury debt and the US dollar, a trend which is now clearly in motion following the announcement of the initial $700 billion bailout of bad bank debt, there should be no illusion that $700 billion marks just the start of an eventual bailout that will exceed several trillions of dollars in the face of global deleveraging of the huge $500 trillion dollar derivatives OTC market, which will likely claim many more banks as counter parties continue to fail. Meanwhile stunned US senators having been finally told the truth by Bernanke, now contemplate the implications for their own 401(k) & IRAs let alone what's good for the country in the long-run, as nearly 30 years of market de-regulation comes to an end and we enter a new era of government capital controls. Frantic talks during the weekend fail as Paulson states that there will be no Bailout for Lehman's. The bank is dumped by potential suitors such as Barclays and effectively allowed to go bankrupt. Stocks expected to tumble Monday, threatening the start of the next leg of the stocks bear market. Lehman's declares bankruptcy, serious risk of default on country party derivatives result in central banks pumping in $100 billion into the money markets which follows the announcement of $70 billion on Sunday as they attempt to contain the impact of Lehman's bankruptcy. Bank of America takeover of Merrill Lynch for $50 billion, the worlds third largest Investment bank to prevent a Lehman's style bankruptcy. HBOS, Britain's biggest mortgage bank crashes 30%, after being targeted by short-selling hedge funds that sought a similar fate for the bank as Northern Rock. I was probably one of the first to break the news of an hedge fund assault on the bank as a similar attack of March this year was still fresh in my mind, therefore had a head start on the scrambling mainstream media that only started to connect the pieces together some 24 hours later. The worlds largest insurer AIG seeks bailout cash, with speculation that the insurer seeks a loan of between $30billion and $75 billions from the Fed. Stock Markets Crash, Dow Jones ends down 504 points. Money markets freeze with the interbank rate (LIBOR) jumping to 6.75% due to the extreme risk of counter party default. No US interest rate cut, despite calls and speculation that the Fed could cut by as much as 50 basis points. AIG, the worlds biggest Insurer bailed by the Fed for an initial $85 billion for an 80% stake in the insurer. Stocks bounce on AIG bailout, Dow Jones rallies 142 points. 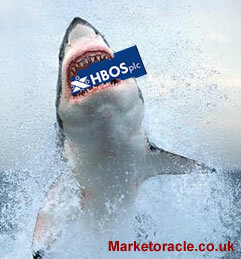 HBOS taken over by Lloyds TSB for £12 billion amidst a stock price crash of 66% in 3 days. The shotgun wedding was to prevent another Northern Rock style collapse and nationalisation, precisely the possibility warned of on Monday. My analysis called for restrictions on short-selling to give distressed financial institutions room to breath. Gold as a safe haven soars by historic one day move of $85 following the news of the AIG nationalisation, and Lehman's continuing impact on counter parties with no end in sight to the crisis. Russians shut down their exchanges fearful of a similar collapse to that which followed the LTCM crisis a decade earlier. Stock market slide resumes as the market lines up the next financial dominos to fall, investors fearful of capital losses dump financial's. Dow Jones ends down 450 points. Lloyds TSB takeover of HBOS confirmed for £12 billion ($21 billion) or £2.32 pence per share in a all stock deal. Morgan Stanley the next big investment bank to be targeted, with expectations of merger with Wachovia. UK FSA announces a ban on short-selling of financial stocks, I suggested this as a necessary move some 24 hours earlier. This and the central bank extra liquidity is seen as extremely bullish on a short-term basis at least, as short covering will lead to a strong rally as well as speculators jumping on the band wagon. US Stocks soar in late trading following speculation of further restrictions on short-selling and a huge bailout. Dow Jones ends up 410 points. US Treasury announces the Mother of All Bailouts - Stocks soar across the board on the intention to allocate an initial $700 billion and probably countless trillions more to buy up much of the financial sectors bad illiquid debt. the UK FTSE rockets higher by 8%. SEC also expands short-selling restrictions to 799 financial stocks, which contributes to the short-covering rally that leaves the Dow Jones up 369 points. Washington expands the "mother of all bailouts" by guaranteeing money market funds that invest in high risk instruments like commercial paper. Is your Bank Safe ? The Fed's and other central back action does not mean that all the banks have now been saved, as last weeks example of the worlds fourth largest investment bank Lehman's going bankrupt illustrates that literally many hundreds if not a thousand plus banks will go bust during the course of the worsening credit crisis, with all of the consequences for depositors. The following report by EWI presents a list of the 100 safest banks. Whilst we can discuss the reasons for the rally late last week, i.e. short-covering as well as speculator driven buying in advance of short-covering which implies that the action is direct response to fundamental news. From a technical viewpoint the surge in the stock market of Thursday and Friday is extremely bullish as it both occurred from a level of extreme market volatility as measured by the VIX and the rate of increase was far greater than the preceding declines, these are strong technical indicators of a significant bottom having been made. However, I do expect next week to see a retracement of the rally in the order of 50%, which given the magnitude of the rally would represent a significant decline, i.e. target 11,000 on the Dow 30 and 5150 on the FTSE 100. Gold's breakout above resistance was not unexpected given the magnitude of the crisis, however Fridays action implies that deleveraging may play a bigger hand in the coming weeks than Gold's safe-haven status or the impact of the devaluation of all fiat currencies. The other trends observed that ARE backed up by fundamentals i.e. US Treasury Bonds Sharp Decline - The technical's AND fundamentals support a treasury bond bear market and the infant US Dollar bull market from the 71 low looks like its come to a premature end , which suggests a continuation of the long term bull market as of 2001. Though this outcome is also dependant upon to what degree other countries follow the US example of unlimited money printing bailouts in the face of a collapsing banking system, which many probably will. The big beneficiary, will eventually be commodity prices, I say eventually because prices in the long-run will be supported by the highly inflationary money printing that is going on as evidenced by the ever larger bailout announcements, whilst at the same time hit by the impact of deleveraging which is deflationary. So it definitely means whatever investments investors contemplate will have to be for several years. Investors should keep their eyes on the often mentioned mega-trends which to summarise are - climate change, population growth, emerging markets middle class wealth growth. Therefore the long-term sectors remain as- energy, agri-foods, commodities and emerging markets (construction and consumerism) despite immediate term volatility. Off course the volatility is a god-send to short-term traders, so in that light I close with news that I will be updating my article of October 2007 to include the " Real Secret of Successful Trading" that I intend on publishing next month in the lead up to the 21st anniversary of the great crash.